It occurred to me, while banging nails into the new screened porch we were building for Jim Lepage’s camp up on Maine’s Caribou Lake, that the desire for a little place near the water where we can get away from it all is a powerful driver of human behavior. These days, with so many of us living in cities and suburbs and enduring tedious commutes to jobs that we sometimes love but more often simply tolerate and occasionally outright despise, it’s no wonder that we carry in our hearts a shining vision of a cottage upon a hill overlooking a pond where herons wade, a lake where mountains invert their visages, an estuary where ospreys soar, or a river that flows past in an endless cycle of renewal. For anglers, this fuzzy paradisiacal image has a sharper focus. We want our little home away from home to front on a pond where trout rise, a lake where bass swirl, an estuary where stripers blitz, and a river where salmon swim in from the sea in their own endless cycle of renewal. I’ve met a lot of anglers over the past six decades, and the only ones who didn’t long for their own little place on the water were those who already had one. 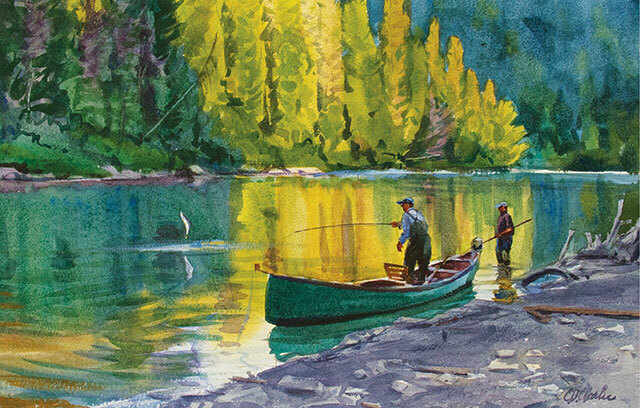 Back in those hazy days between infancy and first grade, I remember another summer when men gathered to bang nails: my father and his fishing buddies in our big backyard turning a pile of lumber into the first fish camp on East Tennessee’s Tellico River. It was Bob Orrin’s cabin. He bought the materials and, being a nuclear engineer, he designed it: two connected cubes with pyramidal roofs, a hard-shell version of the World War II army headquarters—and hospital—tents where these men had so recently expended their youth. It would be prefabricated in panels, trucked to Tellico on rough wagon roads and abandoned narrow-gauge railroad beds, and erected alongside the river to become a different kind of headquarters for this band of brothers. On our visits there I remember thinking it must be the finest thing in the world to have not one house but two, and the best of them nothing like Bob’s nice house four doors down from ours with its deep carpets, pine paneling, and the very first television I ever saw. Instead, Bob’s cabin had kerosene lanterns, bunk beds, an outhouse, and, best of all possible things, a wild river running a few feet from its doorstep. The cabin glowed with magical possibilities that a regulation middle-class house in a regulation middle-class neighborhood could never hope to acquire—shiny new television or not. Long before entering first grade and learning that life has many paths and we are free to choose which ones to follow, I had decided that one day I’d build my own cabin on a distant, wild river. But for one reason or another I never quite did. I did build a house—banging nails, sawing lumber, and teetering on a ladder wondering why things weren’t fitting together as precisely as I’d eng-a-neered them. And although the house doesn’t overlook a wild river, it’s a five-minute walk from a small pleasant trout brook that forms our back boundary for most of a heavily wooded mile. For thirty years it was our little place away from it all, a cottage upon a hill at the edge of a small Maine town of 2,600 souls, our front yard a blueberry field that turns red with the frost, and our backyard an unbroken evergreen forest. But these days forests near small towns don’t stay unbroken. I was up at my friend Jim’s on Memorial Day weekend partly to help him and his son Brian with their porch and partly so I could no longer hear the sounds of machinery across the small pleasant trout brook. The new owners of the adjoining ninety acres were peeling away the trees and the very earth itself, and the soggy, boggy neighboring woodlot was transitioning from the home of deer and partridge and turkeys and foxes into an antiseptic subdivision containing as many as forty-five regulation suburban houses. This left me thinking that our compromise scheme of living year-round in a hybrid between a fish camp in the woods and a proper house at the edge of a proper town had its short-range charms and its long-range flaws. And I wondered whether I’d gotten too creaky to think about building some nice little place near the water where I can get away from it all now that there’s something to get away from. When I sit home by the fire I wholeheartedly agree with that famous waterfront cabin builder, Henry David Thoreau, who wrote that “there is some of the same fitness in a man’s building his own house that there is in a bird’s building its own nest.” But teetering on a shaky ladder banging nails into Jim’s porch brings to mind the all-enveloping experience of building a house, and I figure I’d rather spend my remaining years fishing than banging nails—or, worse, working far into my dotage to earn the money to pay someone else to bang my nails. Not that there’s a shortage of fish camps whose nails have already been banged. Check the ads in the back of huntin’ and fishin’ magazines and, depending on the targeted demographic, you’ll find everything from a medieval castle on Scotland’s River Spey to a tar-paper shanty on Mud Pond. There is a camp out there for everyone who wants one—or at least for everyone who can afford one, which isn’t always the same thing. Lately I’ve been lingering over these ads and imagining a little place on a river in northern Maine, New Brunswick, the Gaspé, or Labrador. I’m not sure I’m ready or even able to buy, but meanwhile I’m lucky enough to have friends like Jim whose fish camps I can sometimes borrow in return for a bit of nail banging, outhouse shifting, and all those other enjoyable tasks that make proper fish camps so much more than simply a place to sleep. A proper fish camp is a bit like obscenity: difficult to define but you know it when you see it. Certainly my brother’s cabin fits the description—a small cottage teetering on a steep hillside not ten minutes’ brisk walking from the riverbank where our father and his friends built Bob’s cabin all those years ago. Because modern fish-writing forces us to be travel-writers as well, some of us know people outside our ordinary spheres who own riverside castles—their walls lined with first editions and their kitchens staffed by culinary-school graduates wearing spotless white. But the camps of my everyday peers uniformly fit the old-fashioned archetype: rustic structures built by friends and furnished with castoffs from family homes. Odds and ends of dead animals and fish adorn the walls. Old sporting magazines molder in corners along with camp diaries that track day-to-day activities stretching back into the misty past. The plumbing is rudimentary to nonexistent. The kitchens smell of bacon and eggs and beer. Dust balls of cast-off fly-tying materials blow across the floors like Texas tumbleweeds. But no matter how humble or elegant, from shack to castle, there’s always an open-air porch where everyone spends their time away from the river sitting and talking and listening to the loons and the whippoorwills far into the night. That’s exactly what I was doing when I wrote these words back at Jim’s camp in early August. But this time I was alone. Jim was working at his job with Orvis in Vermont. His son Brian was at his job guiding fly fishermen in Colorado. And I was sitting on the screened porch, into which I banged those nails, watching Mount Katahdin gnaw its way through the clouds of a passing thunderstorm, watching a rainbow arc across Caribou Lake, watching a family of black ducks paddle by, and listening to the loons eerily declaring their territories: It’s mine, mine, mine. Another thunderstorm was making in from the west, and the battery-powered radio called tomorrow a washout with triple-digit temperatures, violent wind, and drenching rain. Not a day for fishing even though my favorite river was only twenty minutes away. 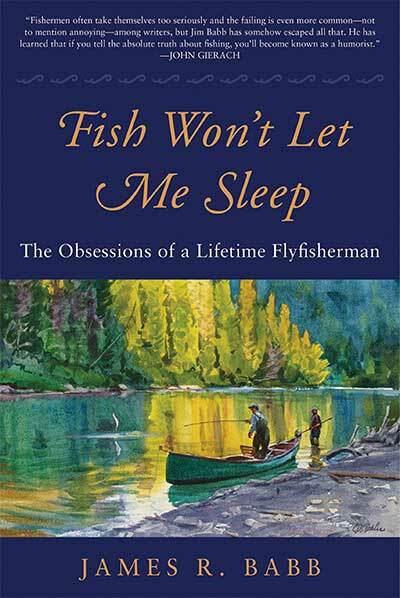 Excerpted with permission from Fish Won’t Let Me Sleep: The Obsessions of a Lifetime Flyfisherman by James R. Babb. Copyright 2016, Skyhorse Publishing, Inc.